If you've ever been on the sort of super tight budget that involves having to subsist on instant noodles morning, noon, and night, you're probably not too keen on ever eating them again. 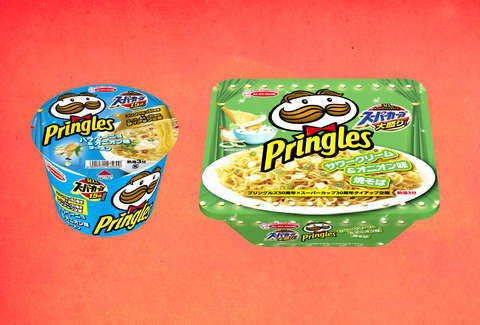 However, the folks at Pringles are really hoping to rekindle your appreciation for the stuff with the debut of all-new packs that are flavored just like its popular potato chips. To celebrate its 50th anniversary, the iconic chip brand teamed up with the Japanese noodle company Super Cup, and has unleashed two special instant noodle cups blasted with flavors found in some of its most popular chip varieties. Specifically, they're selling a Sour Cream and Onion Yakisoba featuring stir-fry noodles mixed with a seasoning blend of onion, garlic, and sour cream flavors, plus an Jalapeno and Onion twist on a more traditional chicken noodle cup, garnished with flecks of potato and onion. Taking things a step further, the two brands have also teamed up on two limited-edition chip flavors inspired by Super Cup's squid and chicken offerings. Unfortunately, the items in the collaboration are available exclusively in select supermarkets and convenience stores in Japan, so you'll either need to find a friend over there to ship you some, or book a quick trip around the world to stock up. Then again, if you can actually afford to jet to Japan just to pick up snacks, your palate has probably evolved to appreciate things quite a bit finer than instant noodles.